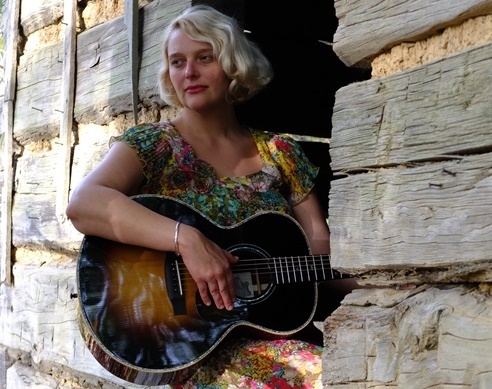 Jeni Hankins, singer and songwriter with Appalachian roots, now living in England, at Caltech Saturday, October 6! Tickets are $20 for adults and $5 for children and Caltech students. They are available at the Caltech Ticket Office by calling (626) 395-4652 and at the Caltech Ticket Office in their new location at 1200 E. California Boulevard in Pasadena (Southeast corner of Wilson Avenue). Their usual hours are 10:00 a.m. to 4:30 p.m., Monday through Friday. You can get them online (for a fee) until Thursday, August 23 here. There is a fee for both phone orders and for online tickets, while purchases at the Ticket Office are free. Tickets can also be purchased (without additional fee) at the door of the venue one half hour before the show. Join our mailing list and you’ll be sure to be notified about the show a few weeks ahead of time. The show will be in Beckman Institute Auditorium (“Little Beckman”) at 400 South Wilson Avenue. Free parking is available in the lot behind Beckman Auditorium (“Big Beckman). You can always find parking for our shows in the two parking structures on Wilson Avenue, just south of Del Mar Boulevard. On weekends and after 6:00 PM, you may park in spaces that have individual names. Restrictive wording at the structures refers to weekdays before 6:00 PM. There is also parking available on Wilson Avenue itself. Beckman Institute is on the other side of the large lawn on Wilson Avenue, on the first floor of the left portion of the building. If you get to the fountain and pools that point toward the white, round, building (Beckman Auditorium, which we refer to as “Big Beckman,” you have gone too far. See this map. Beckman Institute is building #74 and the parking structures are #123 and #124.